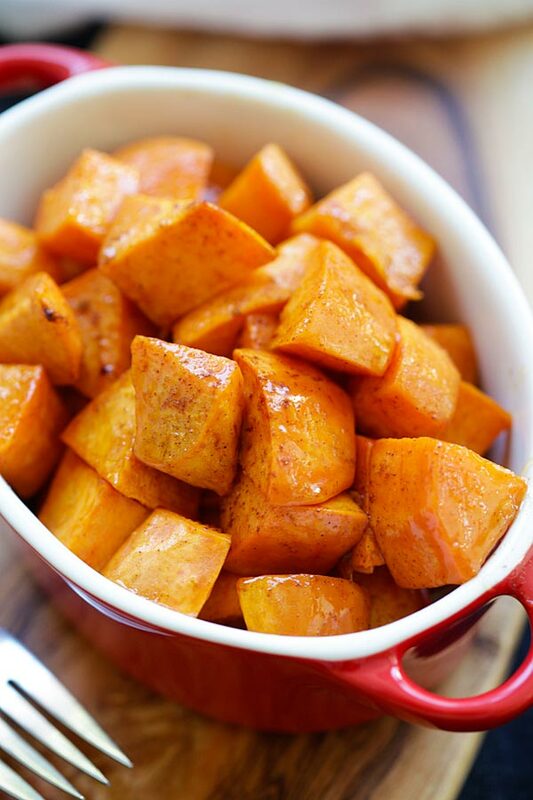 Honey Cinnamon Roasted Sweet Potatoes - the best fall and Thanksgiving side dish that everyone can't stop eating. Easy peasy and fool-proof. Thanksgiving is less than two weeks away and I am sure everyone is planning on the biggest meal of the year! 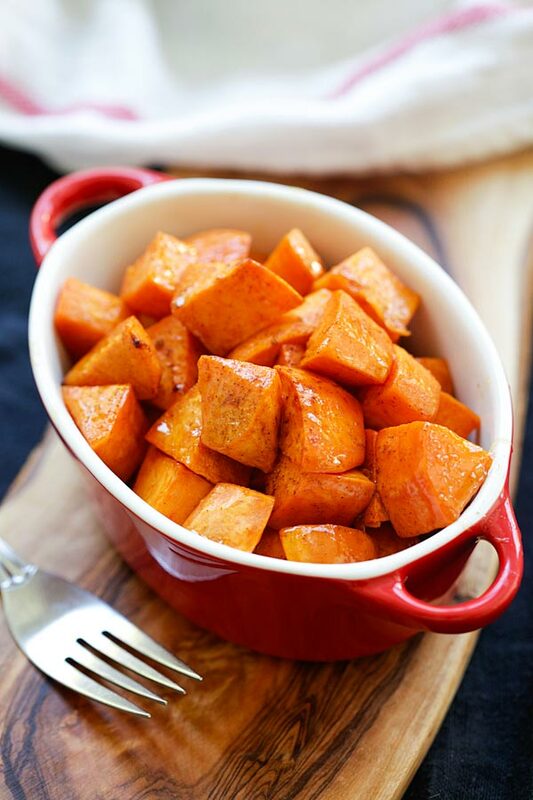 If you are looking for a perfect side dish to go with your turkey, look no further than this amazing, easy, and absolutely delicious honey cinnamon roasted sweet potatoes. The combination of melted butter, honey and cinnamon make this sweet potato a must-have; just imagine the sweet taste of tender, soft, melt-in-the-mouth sweet potatoes and the unmistakably cinnamon scent and aroma wafting in the kitchen. To me, this is one of the best Thanksgiving side dishes ever! What’s more, this recipe is completely fail-proof, fool-proof, with an active time of practically less than 10 minutes. First, you pre-heat your oven to 375F, peel the skin off the sweet potatoes, then toss it with melted butter, honey and dashes of cinnamon. Bake in the oven for 30 minutes and you’re set. Depending on how big your family is, you will need to double or triple this recipe. 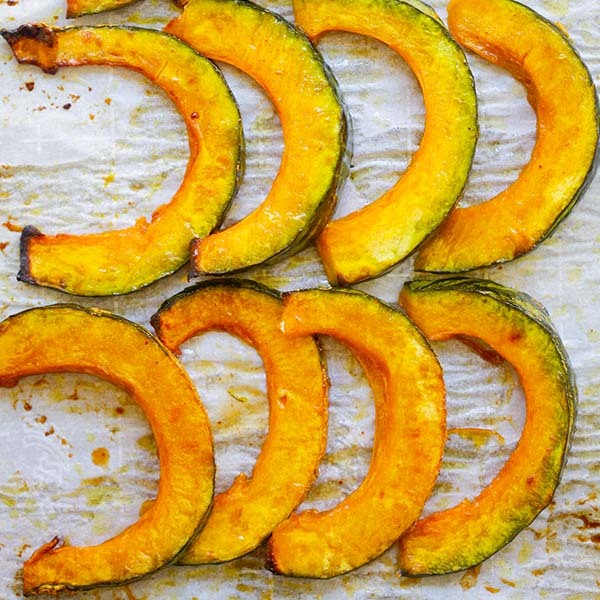 Other side dishes that you can try are honey roasted butternut squash, garlic Parmesan roasted butternut squash, and garlic herb roasted potatoes. I can’t wait for Turkey day!! 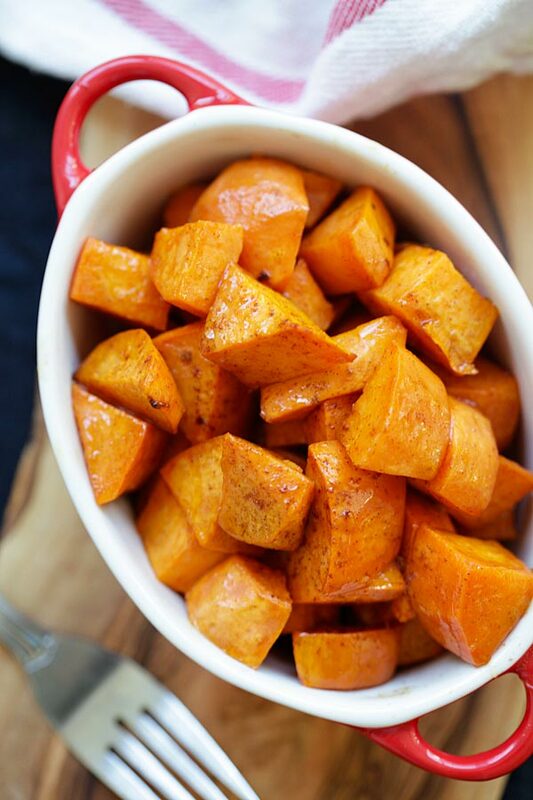 Toss the sweet potatoes with the melted butter, honey and ground cinnamon. Transfer them to a baking sheet lined with parchment paper. Spread the sweet potatoes evenly in a single layer. Roast in oven for 30 minutes. 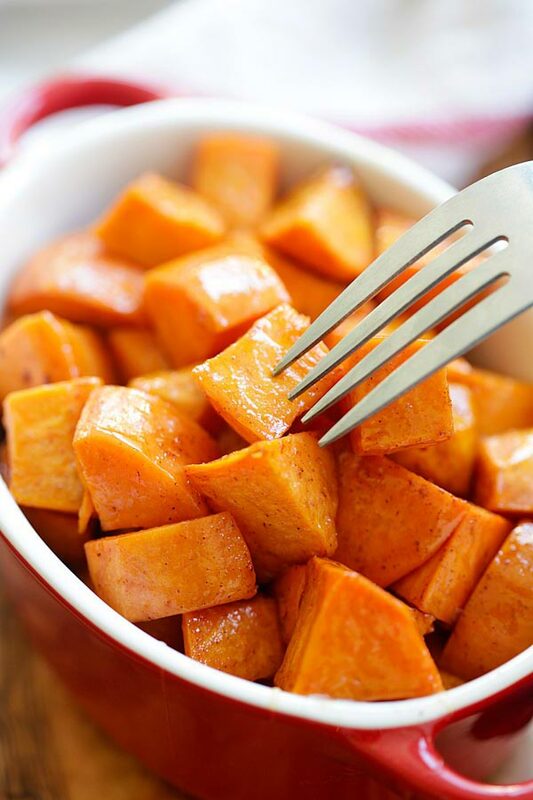 Transfer the sweet potatoes to a serving platter and serve immediately. All photos and recipes on Rasa Malaysia are copyright protected. Please do not use the photos and recipes without prior written permission. 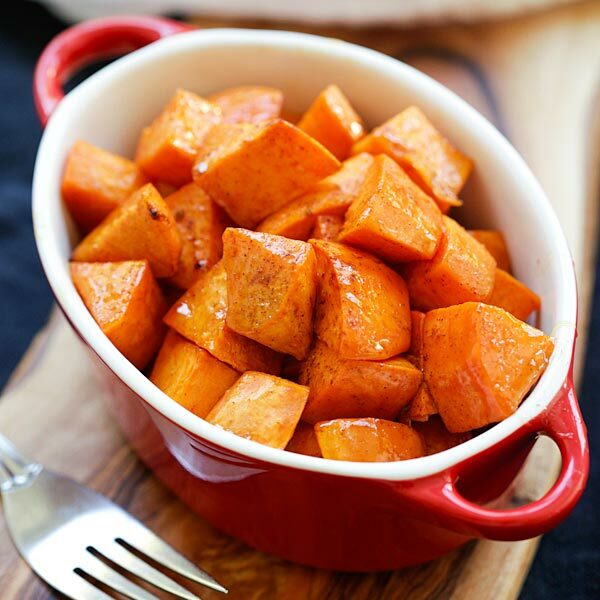 If you wish to republish this recipe, please rewrite the recipe in your own words instead of copy and paste and link back to //rasamalaysia.com/honey-cinnamon-roasted-sweet-potatoes/. Thank you very much! This sounds delicious, and I would love to try them! Can you tell me about how many sweet potatoes are 20 oz.? 2 or 3, depending on the size. Thank you so much Rasa! I’m about to try this for our Thanksgiving dinner. Thanks for sharing! 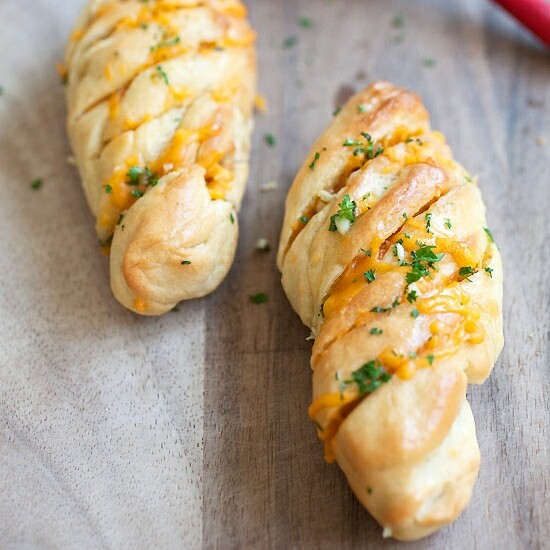 I’m obsessed with this recipe right now! I also tried making it with yams, and that was great, as well. Thanks Lynda, I will try yam! This dish is so much more delicious than it sounds… With few ingredients and the quick and easy steps, one does not expect much – but this was absolutely great!! Thank you so much for sharing, this tastes like my grandmother’s sweet potatoes, and oh how I miss those! I use allspice rather than just cinnamon because allspice has a richer flavor. Oh, also some cumin for heat. I hate the thought of losing all the goodness in the peeling. 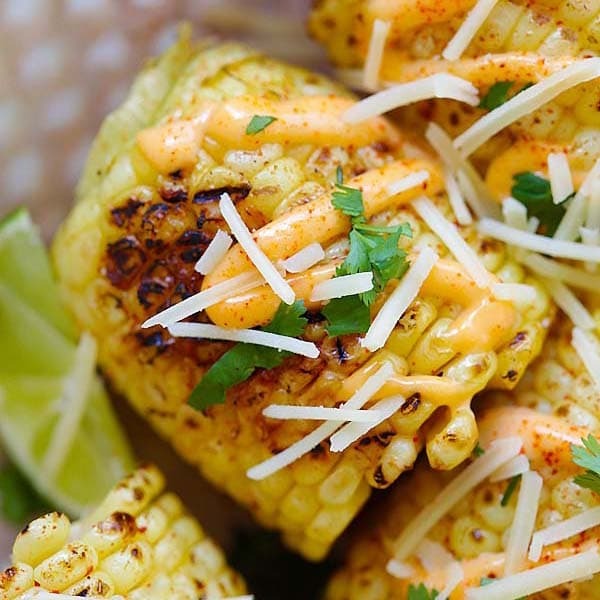 Have you tried this recipe with the peeling left on?